In the Political Body Blog, I will write an entry about each work or group of works of art in the exhibition The Political Body. Two Winston Boyer Mask Series images emerged for me as a powerful contribution to The Political Body. 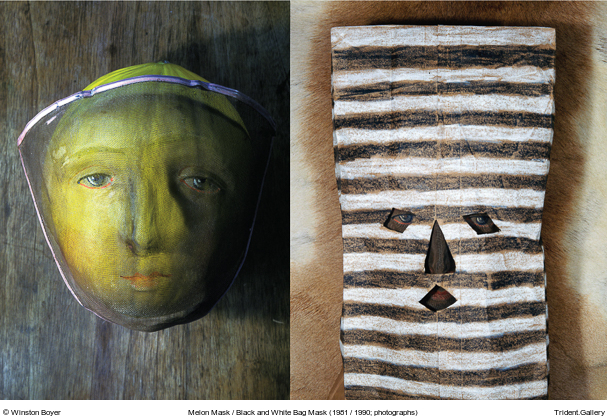 The anxieties of Black and White Bag Mask are tempered by the fun and play of Melon Mask, and both images conjure powerful emotions and meaningful circumstances involving bodily appearances and identity. Gabrielle Barzaghi‘s Cephalic Frieze was one of my core choices for The Political Body around which ideas for the exhibition coalesced. It shows vividly how distance simplifies, which is a profound moral idea about personal identity.